Video live streaming is a type of solution in which the user can select and view live video content. Video live provides the user access to a wide range of live digital content such as sports, concerts, events, and more. Video live streaming solutions offer reliability, efficiency, and cost-effectiveness for media streaming on any screen across a vast range of industries and streaming types. Growing adoption of online multimedia content is one the major reasons for viewers moving toward multi-screen services. Consumers prefer video live streaming solutions due to high-speed network access and availability of connecting multiple devices, such as tablets and smartphones. Furthermore, live video service providers have an opportunity to enhance their video delivery platforms and to provide cross-screen services through the support of extended devices. With advancements in broadband services, data access for streaming live videos have increased greatly, enabling viewers to experience improved video quality without any lag in real time. This helps video service providers to deliver streaming services through mobile phone networks and terrestrial television stations. Introduction of several streaming media devices such as Google Chromecast (Google Inc.), Apple TV (Apple TV), Slingbox (Sling Media), NVidia Shield (NVIDIA Corporation), and Fire TV (Amazon Inc.), has transformed the viewing experience across mobile devices such as smartphones, tablets, and laptops to a great extent. Increasing use of mobile TV services is also anticipated to have a significant impact on video live streaming solutions. Moreover, growing number of viewers is also creating opportunity for the live video streaming solutions market. Nowadays, increase in live video streaming options where viewers can stream live content from an online source is generating wide ranging opportunities for consumers who have better control over when they watch, what they watch, and how they watch their favorite content. The global video live streaming solutions market has been segmented in terms of component, software solutions, industry, and region. In terms of component, the market has been segmented into software and services. The software market is further divided into on-premise and cloud. The cloud segment is classified into public, private, and hybrid. The services segment is also divided into professional and managed services. Based on software solutions, the market has been segmented into editing and transcoding, delivery and distribution, analytics, video security, publishing, captioning, and archiving. On the basis of industry, the market is divided into education; government; media and entertainment; gaming; retail; banking, financial services and insurance; healthcare; and others. Geographically, the market has been segmented into North America, Europe, Asia Pacific, Middle East & Africa, and South America. The North America region is dominant in the adoption of video live streaming solutions. This is due to the increasing availability of live content and their adoption across the region. It has a high penetration rate for video live streaming solutions due to its large subscriber base connected through multiple platforms. The market is in the emerging stage in the regions of Asia Pacific (APAC), Latin America, and Middle East & Africa (MEA). Video live streaming solution providers have been expanding their presence in South America by collaborating with local content producers and live video service providers. Furthermore, with increasing access to live video services through smartphones and tablets, service providers are focusing on developing efficient mobile applications to deliver digital content. Asia Pacific is anticipated to witness significant growth primarily due to the rising penetration of smartphones and the development of high-speed network systems across the region. This report on the global video live streaming solutions market offers revenue share analysis of several vital participants. Some of the key players profiled in the report include IBM Corporation, DigiVive Services Pvt. Ltd., Haivision, Inc., Qumu Corporation, Contus Support Interactive Pvt. Ltd., Sonic Foundry Inc., Telestream, LLC, Wowza Media Systems, LLC, Livestream LLC, and Ooyala, Inc. The video live streaming solutions market report provides analysis for the period 2016 – 2026, wherein the period from 2018 to 2026 is the forecast period and 2017 is the base year. The report covers all the major trends and technologies playing an influential role in the market’s growth over the forecast period. It also highlights the drivers, restraints, and opportunities for the analysis of market growth during the said period. The study provides a complete perspective on the evolution of the global video live streaming solutions market throughout the above mentioned forecast period in terms of revenue (US$ Mn). The market overview section of the report demonstrates market dynamics such as drivers, restraints, and opportunities that influence the current nature and future statusof this market, key market indicators, ecosystem analysis, and pricing analysis.Further, key market indicators included in the report provide the significant factors which are capable of changing the market scenario. These indicators are expected to define the market position during the forecast period and provide an overview of the global video live streaming solutions market. A market attractiveness analysis has been provided for every segment in the report, in order to present a thorough understanding of the overall scenario in the video live streaming solutions market. The report also offers an overview of various strategies adopted by key players in the market. On the basis of component, the market has been segmented into software and services. The software segment is segmented into on-premise and cloud. The cloud segment is further segmented into public, private, and hybrid. The services segment is also further classified into professional services and managed services. In terms of software solutions, the market can be divided into editing and transcoding, delivery and distribution, analytics, video security, publishing, captioning, and archiving. Based on industry, the market is divided into education; government; media & entertainment; gaming; retail; banking, financial services & insurance; healthcare; and others.The report covers the analysis of these segments across North America, Europe, Asia Pacific, Middle East & Africa, and South America, along with the qualitative analysis for market estimates supplementing the growth of the video live streaming solutions market during the forecast period. 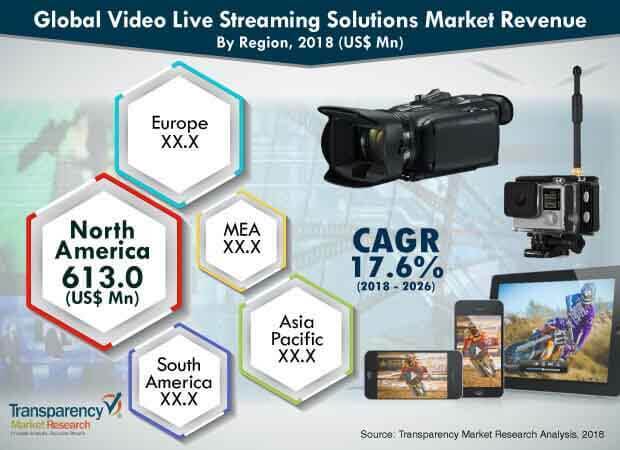 The report also highlights the competitive landscape of the global video live streaming solutions market, positioning all the major players according to their presence in different regions of the world and recent key developments initiated by them in the industry. The comprehensive video live streaming solutions market estimates are the result of our in-depth secondary research, primary interviews, and in-house expert panel reviews. These market estimates have been analyzed by taking into account the impact of different political, social, economic, and technological factors along with the current market dynamics affecting the growth of the video live streaming solutions market. This report provides all the essential information required to understand the key developments in the video live streaming solutions market, and growth trends of each segment and region. It includesstrategies of companies, financial information, and developmentsunder the company profile section. The report also provides insights related to trends and their impact on the market. Furthermore, Porter’s Five Forces analysis explains the five forces, namely buyers bargaining power, suppliers bargaining power, threat of new entrants, threat of substitutes, and degree of competition in the video live streaming solutions market. Primary research involves telephonic interviews, e-mail interactions, and face-to-face interviews for detailed and unbiased reviews on the video live streaming solutions market across geographies. Primary interviews are usually conducted on an ongoing basis with industry experts andparticipants in order to get the latest market insights and validate the existing data and analysis. Primary interviews offer firsthand information on important factors such as market trends, market size, competitive landscape, growth trends, and outlook. These factors help to validate and strengthen secondary research findings and also help to develop the analysis team’s expertise and market understanding. Moreover, the data collected and analyzed from secondary and primary research is again discussed and examined by our expert panel. The global video live streaming solutions market report provides company market share analysis of the various key participants. Some of the key players profiled in the report include IBM Corporation, DigiVive Services Pvt. Ltd., Haivision, Inc., Qumu Corporation, Contus Support Interactive Pvt. Ltd., Sonic Foundry Inc., Telestream, LLC, Wowza Media Systems, LLC, Livestream LLC, and Ooyala, Inc.